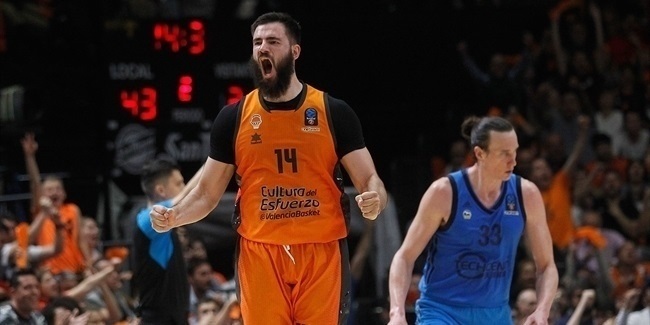 Brandon Triche will remember his Eurocup debut for years to come. Not only was the Virtus Rome guard the star as his club rolled to a 59-88 victory at Proximus Spirou Charleroi, but he is also the Eurocup Regular Season Round 1 MVP. 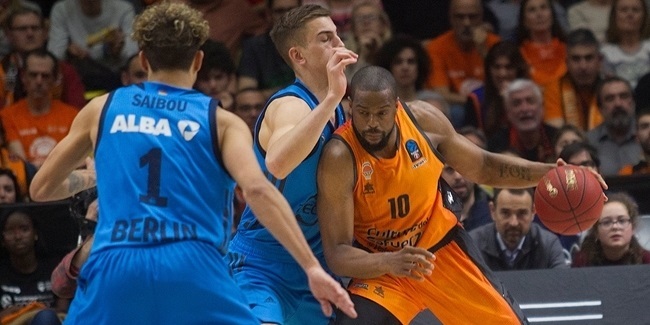 Triche recorded 26 points, 6 rebounds, 5 assists and 3 steals for a performance index rating of 37, which was the best of any player in the Eurocup’s 18 opening week games. Triche only committed 1 turnover and drew 8 fouls too. The second-highest index rating of the competition’s Round 1 came from Lokomotiv Kuban Krasnodar’s Derrick Brown, who packed up a 33 in his team’s 78-97 win at Stelmet Zielona Gora. Brown tallied 23 points, 5 rebounds and 6 assists. Juan Palacios of Pinar Karsiyaka Izmir posted 29 points and 10 rebounds for a 30 index in an 81-87 double overtime loss to PAOK Thessaloniki. Jake Odum of PAOK scored 22 points for a 28 index, which was the fourth best of Round 1. 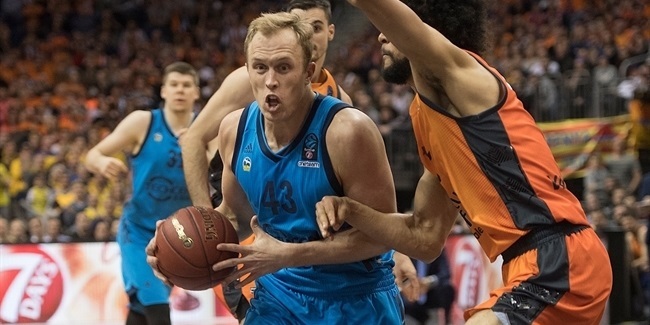 Rounding out Round 1’s top performances were Blake Schilb of Paris Levallois, Walter Hodge of Zenit St. Peterberg and David Vojvoda and Lazeric Jones, both of Szolnoki Olaj, each of whom compiled index ratings of 26. Juan Palacios was Round 1’s top scorer with 29 points. No one in the Eurocup had more rebounds in Round 1 than Trevor Mbakwe of Brose Baskets Bamberg with 14. The Round 1 assists leaders were Eugene Lawrence of Telekom Baskets Bonn and Marko Marinovic, who each dished 10. Lietuvos Rytas Vilnius’s Mindaugas Lukauskis picked up 6 steals to lead all players. Mirza Begic blocked 5 shots, which were most in the competition. Five players racked up Round 1 double doubles: Palacios, Travis Leslie (18 points, 10 rebounds) of Rytas, David Andersen (14 points, 10 rebounds) of ASVEL Lyon Villeurbanne, Walter Tavares (12 points, 13 rebounds) of Herbalife Gran Canaria Las Palmas and Bonn’s Lawrence (10 points, 10 assists).